Painting houses and farms in the Karoo – that’s where you’ll find Rudolph Clench these days. Country Life Magazine gives Karoo Keepsakes II a Thumbs-up! Our latest Karoo book reviewed by SA’s top country lifestyle magazine. The Great Karoo stars in Khumba, a locally-produced animated movie. 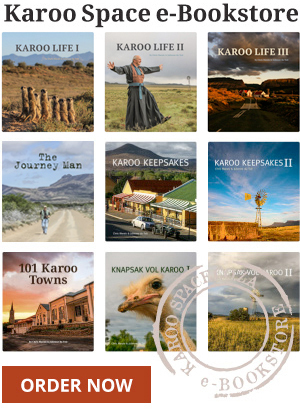 Karoo Keepsakes and Zen Dust – both hits at the Richmond Bookfest. Prince Albert is one of the most organised, stylish and bountiful ‘foodie towns’ in the Karoo. Philipstown in the Northern Cape just had a huge week. In three days it became the quilting capital of South Africa, the 2013 venue of the Karoo Parliament and the wire car championships of the Karoo. The Khoi and Bushmen (San) believe this bulb to be the link between the living and the dead.